If Roger Federer Falls In A Second-Round Match, Does Wimbledon Really Exist? Roger Federer was in no mood for smiles today after he was knocked out of Wimbledon in the second round in a shocking loss to Ukraine's Sergiy Stakhovsky. Well, his world ranking is in the triple digits, but after losing the first-set tiebreaker to Federer, Stakhovsky stormed back to the take the next three sets. Sergiy Stakhovsky, ranked No. 116 in the world, has eliminated Roger Federer from Wimbledon. Thus ended Federer's incredible record streak of reaching (at least) the quarterfinals of 36 straight Grand Slam tennis majors. The last time Federer didn't at least make the quarters of a Grand Slam was the 2004 French Open, when he lost to Brazil's Gustavo Kuerten. 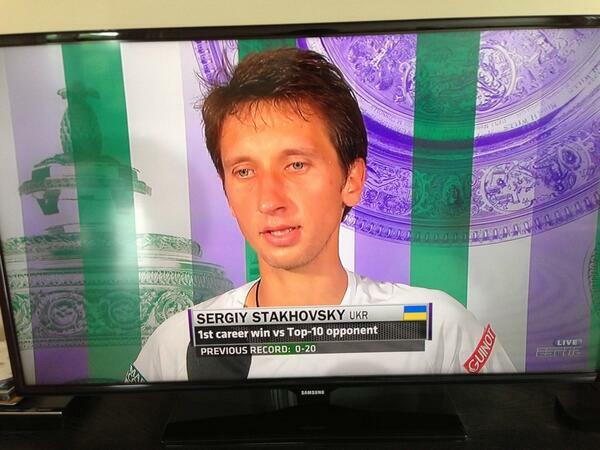 And how unexpected was today's win by Stakhovsky? His previous all-time record against Top 10-ranked opponents was a big, fat 0-20. At 31 years old, can Federer make another deep run at a major tournament? His window certainly is closing, and younger blood has always had the advantage in tennis, but we'd be foolish to write off the Swiss legend so quickly. But only one thing's for sure: This Wimbledon is now officially anyone's to win. YOU KNOW WHAT MUST BE DONE, ANDY MURRAY.